1. The solar revolution is happening. Nothing makes that any clearer than putting up one of upstate’s largest solar arrays on land held as part of the Cayuga coal power point. Just about every news agency in a fifty mile radius got the press release, but the Lansing Star has in-depth coverage. The $25 million project, to be built on 75 acres of the plant’s 434-acre site in Lansing, would create an 18 MW array that would be able to power 3,100 homes. 150 construction jobs would be created, although the permanent job growth is nearly nil. The site is well-suited because it is easy to hook-up to the existing grid, the zoning is appropriate, and Lansing is very keen on growing its tax base – overall, this seems like the right project at the right time. At a glance, this seems to skirt past the 2 MW rule from NYSDEC that limits each project’s size, as some arrays produce as much a 3.3 MW. However, there are nine arrays producing 18 MW, an average of 2 MW each for each array on the Cayuga plant’s property – so it technically meets regulations. It’s not clear if they have to pursue subdivision to make the panels fully legal. Two potential debates are touched on in the Star article. For one, the project may pursue a solar tax PILOT, which would save a fair amount – instead of paying the property tax of about $770,625 (25 million on a tax rate of $30.825/1,000), they would pay something like $8,000/year/MW, just $144,000. The flipside is that local taxing authorities would not be enamored with such a deal. The second potential issue is that the Cayuga Operating Company was mum on whether they’ll close the coal plant, which is probably going to keep Town of Lansing officials up at night. 2. Ithaca College is in the hunt for a new president’s house. The house at 2 Fountain Place in the city’s East Hill neighborhood was deemed unsuitable because it’s difficult to maintain (it was built in 1892), it has an awkward interior layout, and there’s not enough space to host events (it’s 9100 SF on 1.06 acres). The property was designed by Ithaca’s famous 19th century architect William Henry Miller for lawyer George Russell Williams, and was purchased by the college in 1938. Although future options are still being considered, if this hits the market, we are talking a multi-million dollar sale, but lest anyone be concerned, given its historic designation the possibility of inappropriate alterations or demolition is remote. The most recent work was in 2013 for ADA accessibility at the rear porch, an ADA-suitable bathroom, and air conditioning. With 7 existing bedrooms and 5 bathrooms, it could make for a cool boutique hotel or B&B, if someone doesn’t want a personal residence with venerable grandeur. While Ithaca College searches for a new residence (pursumably large, newer and on South Hill), incoming president Shirley Collado and her husband will live in a downtown apartment paid for by the college. Erm…with every due respect, this is a vinyl-sided modular with a poorly-photoshopped dormer and what appears to be a door in place of a garage. The first couple of designs embraced traditional Islamic architectural features, and the second was a great mix of traditional and contemporary design motifs. But this latest version honestly looks like, even if it was done for cost considerations, that every attempt was made to hide its use as a mosque and Islamic center. This image is so poorly done, I’m still not 100% sure if this is some kind of joke, but the floor plan matches up. Oof. 4. Not something one sees all the time – these are photos from last month’s deconstruction of Ithaca’s 107 South Albany Street in preparation for a new three-story, 11-unit apartment building. Developer Nick Stavropoulos hired Finger Lake Re-Use to do the deconstruction, which diverts about 70-90% of materials from the landfill by salvaging the structural components, processing and checking them to make sure they’re in good shape for re-use, and packaged and selling the materials at a low price to interested buyers – for instance, reclaimed lumber could go into bar counters, flooring, or any number of options looking for that well-used look. The cons to this approach are that more work and more time is involved vs. a traditional demolition, which means a greater cost. Also, though no fault of FLR, Historic Ithaca is not pleased (they get bonus shade for arguing in the same article the city should downzone to protect Patterson’s, an auto body shop built in 1983, and keep their “essential service” in downtown Ithaca). The pros are the environmental/sustainable aspect, the creation of “green-collar” jobs, and salvaged materials are tax deductible. Construction on the new Daniel Hirtler-designed apartment building will begin this summer, with occupancy in about 12-13 months. 5. Skill-building for a good cause – The Second Wind Cottages, a housing complex in Newfield that houses formerly homeless men in 320 SF cottages, has connected with high school students and teachers to help assemble a new unit, cottage #13. Supervised students at a high school in suburban Rochester assembled a 320 SF unit in their school’s back lot as part of a class, then partially disassembled it and reassembled it in Newfield. The construction and transport process was borne out out over two days. The non-profit project is led by local businessman Carmen Guidi, who hopes to do a second women’s housing plan further up Route 13 as the current 18-unit build-out wraps up. 1. It looks like the homes designed for Tiny Timbers won’t just be limited to Tiny Timbers. The company has partnered with realtor Brent Katzmann for a to-be-built house in Lansing’s Farm Pond Circle housing development touts a Tiny Timbers-based home design by STREAM Collaborative. 1.09 acres and a 2 bed, 2 bath 1,430 SF house for $219,400. The relatively low price compared to most new builds is in part due to Tiny Timbers’ modular approach – the “Big Cube” retails for $156,900 with a finished basement, and the Farm Pond parcels go for $39k-$45k, so not counting the soft costs (permits/marketing), that pretty much sums up the costs. Farm Pond Circle is a 19-lot subdivision in Lansing town that was the brainchild of the late Jack Jensen. All homes have to exceed state energy code by 20%, cannot exceed 2600 SF, and cannot use aluminum or vinyl siding. A couple lots have been aside for affordable single-family home construction. After Jensen’s passing in 2014, another local homebuilder, Bruno Schickel (Boiceville Cottages), picked up the undeveloped lots (10 of the 19) for about $165k last February, and intends to follow through on Jensen’s plans. 2. Speaking of Tiny Timbers, it appears the budding modular timber-frame builder is expanding their offerings into a full line of homes. Tiny Timbers now has 16 different models in five series. Prices range from a completed 600 SF model with no basement at $109,900, to a 1,950 SF model with finished basement at $197,900, land and well/septic not included. In a blog post on their website, Caleb Dolph, builder Buzz Dolph’s son and the guy in charge of marketing, says that the first sold house is underway in Hector (if Ithaca had exurban areas, Hector would be it), at least five others are in contract, though it’s not clear if any of those are for the 15-lot Varna site. Given that they planned for ten houses in 2017, the Tiny Timbers staff might have underestimated the market, which is more a fortunate challenge than a complaint. 3. A local non-profit is looking to expand its real estate footprint a little bit. Tompkins County Opportunities, Alternatives, and Resources (OAR) is seeking to buy a run-down house at 626 West Buffalo Street and renovate it into five beds of transitional housing for those getting out of jail and trying to get back on their feet. The intent is to provide, safe, secure housing to better help with the transition process, which can include education, job training and mental health and/or addiction treatment. The county would provide $100,000 in a one-time allotment – the house is for sale for $99,999, the purchase offer is for $95,000, and a further $60,000 would be spent on renovations. The rest of the money ($55,000) comes from grants, donations and a mortgage. Ultimately, the goal is to provide decent housing that helps reduce the recidivism rate (convicted persons committing more crimes), ideally saving the county on future court and incarceration costs, as well as what they hope pans out to a lower crime rate. 4. Staying on the topic of special needs housing, the Second Wind Cottages is looking to add another three cottages in Newfield this year. The cottages are modest, ~200 SF and costing $12-$15k each to build. As reported by the Times’ Jaime Cone, every unit provides shelter to a formerly homeless male. Rents are “pay as you can”. A small community facility provides services like a kitchenette, office, washer and dryer. Three more cottages are planned for 2018, which will round out the “campus” with 18 units. A similar facility is planned up the road, one that will house homeless women and children. Although Newfield is a ways out, both sites are on the bus line into Ithaca. The Second Wind Cottages are a private endeavor by businessman Carmen Guidi, and paid for through grants, fundraisers, and donations (money, furniture, etc). Volunteer labor similar to that used for Habitat for Humanity is utilized and welcomed. Like with the OAR house, by providing a safe, warm space to live, these units may help reduce homelessness and the issues homelessness creates. 5. Work has yet to start on the new two-family home planned at 123 Eddy Street in Collegetown, but it looks like developer/landlord Nick Lambrou is seeking major changes to the project. Lambrou wants to replace the approved design at top, with the one below, which is copied from a Craigslist posting. The designs are both by Jagat Sharma, but the new plan is a variant of the two-family homes that Sharma’s doing for Charlie O’Connor at the recently-approved 4-building 607 South Aurora project. The property falls into the East Hill Historic District, which is under the ILPC’s jurisdiction. According to Bryan McCracken, the city’s Historic Preservation Planner, the design will be heading for review within the next month or two. The design has been used before so there’s familiarity with the design and lower risk, plus there are possible cost efficiencies if using the same contractors as O’Connor, because they’ll move quicker as they’ve done it before. On the other hand, unlike 607 South Aurora, this property is in the East Hill Historic District, and full-time neighbors on Orchard Place have been watching these plans very closely – they’re wary of students, and will likely not be fans of the projecting second-floor porch, as the previous version was tucked into the building. Not sure using a slightly more decorated version of a design being deployed elsewhere will get the ILPC’s blessing, but we’ll see what happens. 6. Why yes, Lansing town is still hopping mad about the natural gas issue. The town supervisor cites the tap-out as the cause of delay for Robert Weinstein’s 102-unit Cayuga Farms project, although the previous documentation says it’s a sewer issue – the developer has to deploy an Orenco modular sewer system, which has to be approved by the NYS DEC.
7. Here’s a copy of Maplewood’s buildout timeline. The first Maplewood apartments should start construction in May 2017, pending no issues. 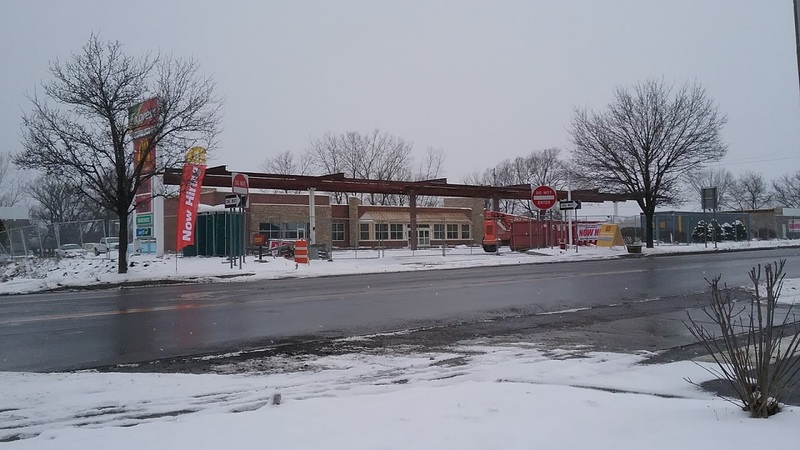 Generally, the crews will be working from the outside in; buildings closer to Maple Avenue and Mitchell Street have earlier construction schedules, while those interior to Maplewood will start in the fall or early winter. Also, street names. Veteran’s Place will continue to be the main thoroughfare, but from north to south, it will intersect with “James Lane”, “East Sylvan Mews”, and “Lena Street”. James Lane wraps around to form the secondary N-S thoroughface on the east side of the parcel. James and Lena Mitchell were the original owners of the property when Ithaca was first settled in the early 1800s. The Stormwater Property Protection Plan (SWPPP) still needs to be okayed by the town of Ithaca, but that’s about the only thing left before final approval is granted. 8. It looks like the Planning Board meeting should be interested. Not a whole lot being decided, but some sketch plans have been submitted. For rental projects aiming for August 2018 openings, Feb-Apr is going to be the primary submission period, as they seek approvals by May or June so that construction can run on a Summer 2017 – Summer 2018 schedule. 238 Linden is a non-historic student rental house, and a John Novarr property in a CR-4 zone – 4 floors, no parking required. Further to that, 240 Linden to its north was taken down for staging space for the Breazzano Center, but as that will be finishing up this Spring, it leaves an MU-2 (six floors, no parking) parcel open for development. A townhomes plan suggest one or both of these parcels will host something not unlike the ikon.5-designed townhouses plan Novarr plans to build at 119-125 College Avenue. If Ithaca’s lucky, it’ll have upscale features like the one finishing up in Dryden. Otherwise, a modern update to the 1980s design is plausible. A number of older McD’s restaurants nationwide have been upgraded to the new design in the past few years. This is intriguing. 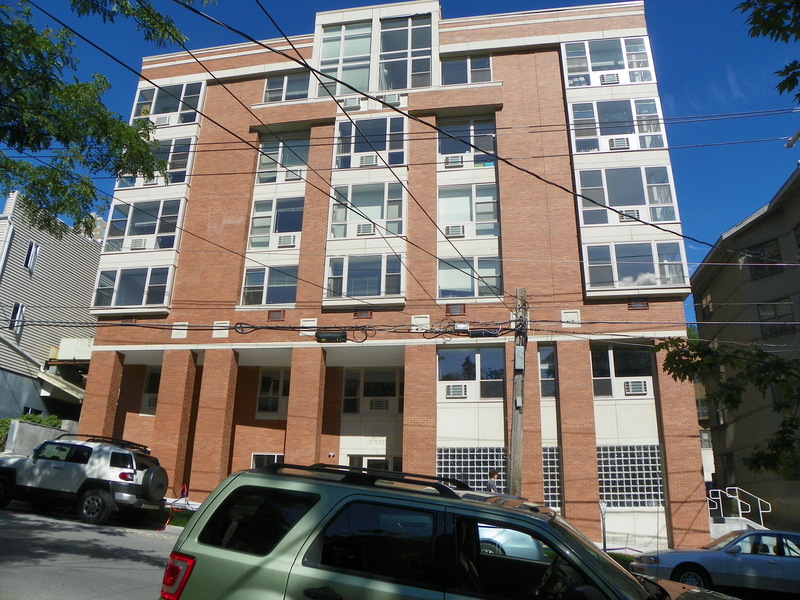 301 Eddy is a Nick Lambrou property in an MU-2 zone – a four-story, 8-unit/37 bed apartment building built in 1995, and it’s also the address for Collegetown Park’s parking lot. One possibility is replacing part of the parking lot with another apartment building – Lambrou may push to six floors, but it’s not his style. He’s described his offerings as “boutique” buildings, properties with less than 20 units and 20-50 bedrooms. Recent examples include 2015’s 116 Catherine Street, and 2012’s 309 Eddy Street. If the past is any precedent, this will be a Jagat Sharma design. 1. It looks like the plans for 107 South Albany Street are getting a major revision. Readers might recall that previously approved plans called for a rear addition onto an existing house to create a 9-unit, 11-bedroom apartment building. The latest plans are a little more substantial. For one thing, the existing house would be no more under the new plan. In its place looks to be a 3.5 story, 8,427 SF, 11-unit apartment building, all one-bedroom apartments. Developer Stavros Stavropoulos has once again turned to local architect Daniel Hirtler for design work; for each of them, this is the largest project they’ve worked on to date. Hirtler came up with a design that offer contextual features like a cornice and an orthodox window arrangement, but adds a modern vertical stair element in the middle of the structure to keep the design from being an imitation. Zoning is CBD-60, so no parking is required, 100% lot coverage is allowed, and the 40.5′ proposal is comfortably within the 60-foot height limit. According to the SPR filing, the construction cost will be about $900k and the construction period will be from September 2017 to June 2018. As much as I dislike seeing attractive old houses come down, the new design fits well into an older urban context. Plus, if the medical practice on State ever gets redeveloped, 3.5 floors offers a nice transition to the lower-density structures further south. I’m not a super big fan of the blank wall next to the recessed entry, although the intent is to make it interesting with light fixtures, a brick pattern and an iron trellis that will be grown over with vines. Fiber cement will be used on the upper floors, with brick veneer and granite accents at street level. On another note, it looks like the city will be looking at a one-lot subdivision next month at 109 Dearborn Place in the Cornell Heights Historic District – the owners, a married couple who are renovating the old PRI into a historically appropriate two-family residence, are looking to sell some of the land as part of the “partnership dissolution”. The PRI renovation is expected to continue. The application says a house was previously located on the undeveloped portion of the property (a glance at old maps indicate a schoolhouse was located on-site in the 1920s). It’s worth noting that the wife is also the owner of Bridges Cornell Heights, a high-end senior living facility on the next block. Bridges previously subdivided a Cornell Heights lot in 2005 to build a second residence to serve its deep-pocketed clients. Any new house would need to go through ILPC review. 2. Meanwhile, the Ithaca Common Council had their monthly Planning and Economic Development Committee meeting. It looks like the revised 323 Taughannock project has been caught up in the TM-PUD, so it will have to get Common Council approval. Apart from a certain councilor’s general objections to housing near or on the waterfront, this one isn’t likely to stir up much controversy. The construction timeline for Steve Flash’s 8-unit , 16,959 SF owner-occupied townhouse project is June 2017 – January 2018, with an estimated value of $2-$3 million. Potentially, there could be 16 units, since each townhouse comes with a live/work space that could be converted to a separate studio apartment unit. Also included at the meeting was a session on electric car infrastructure, votes to send laws allowing dogs in Stewart Park and a temporary altar to the Common Council, votes to circulate a zoning amendment to allow brewpubs in business zones, and a discussion of tree plantings. The Maguires also discussed possibly shifting their project to Southwest Park behind Wal-Mart, which is covered on the Voice here. 3. The city of Ithaca has been awarded funding to build a replacement bridge for North Aurora Street over Cascadilla Creek. Continuing the city’s heavy infrastructure investments of the past few years (for instance, the bridges as Lake Street, East Clinton Street, and the work planned for Brindley Street/Taughannock Boulevard), the state is giving $1.178 million towards the replacement span. Engineering work and public meetings will take place in 2017 and early 2018, with construction and completion by 2019. 4. Over in the town of Ithaca, final approval has been granted to Cornell and EdR’s Maplewood project, meaning that everything is good to go and barring any unforseen circumstances, the 441-unit, 872-bed complex should be open for graduate and professional students by the end of July 2018. The difference between preliminary and final approval is that in preliminary, the concept is greenlighted but there needs to be additional filings completed – tree planting schedules, revised labels on diagrams, construction staging plans, and proof of final approval from the city for their portion. For those who are wondering, the 150-200 workers on-site will be parking at a temporary lot behind the Kinney Drugs at East Hill Plaza, and will be walking the five minutes down Mitchell Street to get to the job site. The first building should start to rise in late Spring of this year, with new structures rising in stages as we go through the rest of 2017. The town planning board also reviewed revised plans for the Rodeway Inn at 654 Elmira Road, where the old wings will now be torn down and rebuilt on the same footprint and an enclosed corridor will be built into the new wings. The final result will have a net increase of four motel rooms, to 44 (the previous plan added only two motel rooms). The plan for renovating the single-family home on the property into a community center is unaffected by these changes and moving forward as originally planned. 5. It’s been behind schedule a few months, but DiBella’s Subs is expected to open at 222 Elmira Road on February 16th. 6. It seemed a little odd when The Computing Center stated in their IDA application that their plans had already been approved, and there was nothing on file. Turns out they’re hoping to get approval for their 4,600 SF HQ from the town of Lansing next week. The full suite of documents can be found on the town of Lansing’s website here. It looks like the farmhouse next door to 987 Warren Drive will be spared from the wrecking ball; although The Computing Center bought the property, it’s being subdivided and the barn-turned-garage is the only building that will be torn down. Lansing has one of the more lenient planning boards, so although this probably won’t be fully approved next week, there’s a good chance this project will receive final approval by the end of March. 7. Over on West Hill, a large vacant parcel on Bundy Road just exchanged hands. The 66.98 acre parcel has been marketed for the past few years as a development opportunity – it has municipal water and sewer, and it’s a stone’s throw from Cayuga Medical Center, Overlook and the Conifer/Cornell developments off of Route 96/Trumansburg Road. Its previous ownership, a family that has owned it in some form since 1964 (moving between members in 1984 and 1991), had it on the market for $359,900. The buyers, a husband-and-wife pair of medical doctors who live nearby, paid $305,000 for the deed, according to a filing on the 9th. An online search for future hints doesn’t really give much guidance – the doctors have donated modest amounts to Finger Lakes Land Trust and have signed some anti-fracking petitions, and while they own undeveloped properties around them, this parcel isn’t adjacent to their house. It doesn’t really fit the Land Trust’s ideal land donations either, since it’s been substantially subdivided with medium-density residential, and borders a growing corridor. So, it’s hard to gauge just what exactly is planned here. For the record, the land is currently zoned medium density residential (max 3 floors, up to 2.9 lots/acre), but the town’s new comprehensive plan sees the property as new urbanist medium density (5-8 units/acre small-scale mixed-use), with undeveloped open space towards the southwest corner of the parcel. 8. Let’s finish this week off with a talk about energy. Good news first – there might be a solution to the West Dryden pipeline issue. Background here, but the nutshell is, Lansing has tapped out their natural gas capacity, and in order to accommodate new development that would need natural gas, NYSEG needs to build a higher capacity pipeline from their current facilities in the town of Dryden. This new pipeline would go along West Dryden Road, but has run into fierce opposition, mostly because Dryden residents are famous for being anti-natural gas – this was the town that took on the fracking companies and won. Keep in mind, these folks aren’t just disdainful of natural gas, they are adamantly opposed. So using their property to accommodate something they don’t like is a bit like asking to build an abortion clinic next to an evangelical church because that just happens to be where the land is cheapest, but they would have to share a driveway. Unsurprisingly, the town of Dryden enacted a moratorium on large-scale pipeline installation. The town of Lansing is not happy because it stymies their development, and they’re extra-concerned that their biggest property taxpayer, the Cayuga Power Plant, is about to go belly up and leave the town with $100 million less on its tax rolls. The county wants to move away from fossil fuels, but it also wants to encourage development and not leave Lansing in the lurch. This week, a plan was put forth that might accommodate both needs. A small compressor station would be built to keep pipe pressure from falling too low during times of peak demand, so that guarantees service for existing customers. The second prong is to wean existing development off natural gas and encourage new development to use other means – electric heat pumps, like those to be used in Maplewood and City Centre. This encouragement would be given through subsidies or tax breaks. The compressor station and the incentives would be in effect by late 2018. It looks promising, but the feasibility studies are still ongoing, and Lansing is not totally on board. Both Lansing Village and Lansing Town feel they were not represented during these discussions with NYSEG, and that heat pumps are a major financial burden to saddle homebuilders with. They also wonder if the electrical grid would be capable of supporting so many heat pumps. Speaking strictly from my experience, I’ve visited construction projects with heat pumps, and while they are a cost increase, it’s a couple percent more than the same structure with conventional heating – there’s a recently-built single-family house I can think of offhand where the cost of heat pumps was about $5,000 more on the $200,000 construction cost. If it’s incentivized, one could make it financially sensible, at least for residential options if not all. Also, I’m wary of Lansing’s reasoning because they piddled away the three town center projects five years ago – if they had stayed on top of it, they’d have $50 million more in property value and this wouldn’t be such a pressing issue now. That being said, there are problems with this area’s approach to alternative energy. Newfield is the big culprit here – they’re about to put in a moratorium on commercial solar panel installations, which is worrying since this is the same town that redesigned their wind turbine law to ban them in essence. If municipalities are limiting residents’ abilities to turn to alternative energy sources (many urban areas have to turn to commercial arrays or turbines because there’s not enough room/too much demand on-site), then the community will be unsuccessful in weaning the population off of fossil fuels. But Dryden, which is in the process of changing their laws to accommodate large-scale solar arrays, is at the forefront of this issue – those panels could provide the electricity for the heat pumps and help turn the tide on energy sources. It only works if everyone cooperates.